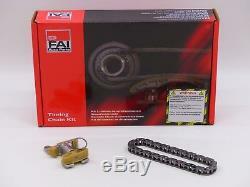 Distribution chain kit audi seat skoda vw 2.0 fsi / tfsi / gti / rs / cupra. This product page has been automatically translated. If you have any questions, do not hesitate to contact us. Control chain kit audi seat skoda vw 2.0 fsi / tfsi / gti / rs / cupra r / r + 16v. Top quality at an affordable price. To avoid buying the wrong is in any case there is buy clarify the fit of the article with us !! here we need key figures 2 and 3 (old vehicle license) or 2.1 and 2.2 (new car registration) and the exact initial registration. Scope of delivery: see photo. You transfer the invoice amount by bank transfer or iban / bic. You will receive our bank details after our departure. Check the status of your order at any time online. Immediate validation of your payment, you will receive your package faster. You choose the item from us on the site and pay in cash. Pay the invoice amount to the carrier the package upon receipt of the delivery. You will receive your item faster, but 6.50 also apply euro. (only for deliveries in Germany).